The cockroaches are an ancient group, dating back at least as far as 320 million years ago. Cockroaches are somewhat generalized insects without special adaptations like the sucking mouth-parts of aphids and other true bugs; they have chewing mouth-parts and are likely among the most primitive of living insects. They are common and hardy insects, and can tolerate a wide range of environments from Arctic cold to tropical heat. Most species of cockroach are about the size of a thumbnail, but several species are bigger. The world's heaviest cockroach is the Australian giant burrowing cockroach Macropanesthia rhinoceros, which can reach 9 cm (3.5 in) in length and weigh more than 30 g (1.1 oz). Cockroaches are generalized insects, with few special adaptations, and may be among the most primitive living neopteran insects. They have a relatively small head and a broad, flattened body, and most species are reddish-brown to dark brown. They have large compound eyes, two ocelli, and long, flexible antennae. The mouth-parts are on the underside of the head and include generalized chewing mandibles, salivary glands and various touch and taste receptors. The body is divided into a thorax of three segments and a ten-segmented abdomen. The external surface has a tough exoskeleton which contains calcium carbonate and protects the inner organs and provides attachment to muscles. It is coated with wax to repel water. The wings are attached to the second and third thoracic segments. The tegmina, or first pair of wings, are tough and protective, lying as a shield on top of the membranous hind wings, which are used in flight. All four wings have branching longitudinal veins, and multiple cross-veins. The three pairs of legs are sturdy, with large coxae and five claws each. They are attached to each of the three thoracic segments. The front legs are the shortest and the hind legs the longest, providing the main propulsive power when the insect runs. 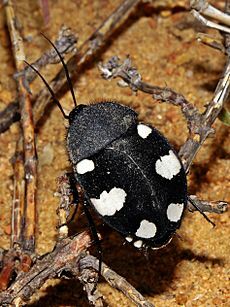 The spines on the legs were earlier considered to be sensory, but observations of the insect's gait on sand and wire meshes have demonstrated that they help in locomotion on difficult terrain. The structures have been used as inspiration for robotic legs. Cockroaches are abundant throughout the world and live in a wide range of environments, especially in the tropics and subtropics. Cockroaches can withstand extremely cold temperatures, allowing them to live in the Arctic. Some species are capable of surviving temperatures of −188 °F (−122 °C) by manufacturing an antifreeze made out of glycerol. Cockroaches occupy a wide range of habitats. Many live in leaf litter, among the stems of matted vegetation, in rotting wood, in holes in stumps, in cavities under bark, under log piles and among debris. Some live in arid regions and have developed mechanisms to survive without access to water sources. Others are aquatic, living near the surface of water bodies, including bromeliad phytotelmata, and diving to forage for food. Most of these respire by piercing the water surface with the tip of the abdomen which acts as a snorkel, but some carry a bubble of air under their thoracic shield when they submerge. Others live in the forest canopy. Here they may hide during the day in crevices, among dead leaves, in bird and insect nests, emerging at night to feed. Cockroaches are among the hardiest insects. Some species are capable of remaining active for a month without food and are able to survive on limited resources. Some can go without air for 45 minutes. Cockroaches become adults in 3-4 months and can live up to one year. A female German cockroach can produce 8 egg cases in her lifetime and each egg case may contain 30-40 eggs. It is popularly suggested that cockroaches will "inherit the earth" if humanity destroys itself in a nuclear war. Cockroaches do indeed have a much higher radiation resistance than vertebrates, with the lethal dose perhaps six to 15 times that for humans. The cockroach's ability to withstand radiation better than human beings can be explained through the cell cycle. Cells are most vulnerable to the effects of radiation when they are dividing. A cockroach's cells divide only once each time it molts, which is weekly at most in a juvenile roach. 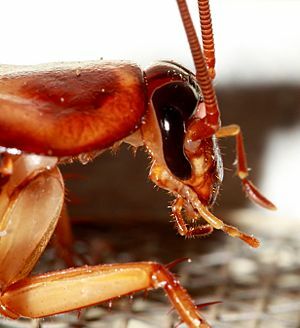 Since not all cockroaches would be molting at the same time, many would be unaffected by an acute burst of radiation, but lingering radioactive fallout would still be harmful. Because of their ease of rearing and resilience, cockroaches have been used as insect models in the laboratory, particularly in the fields of neurobiology, reproductive physiology and social behavior. 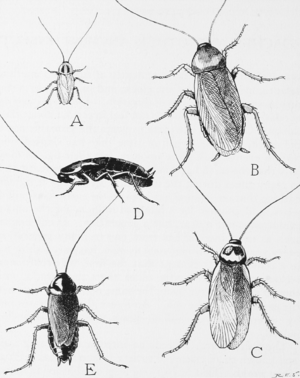 The cockroach is a convenient insect to study as it is large and simple to raise in a laboratory environment. This makes it suitable both for research and for school and undergraduate biology studies. They feed on human and pet food and can leave an offensive odor. They can passively transport pathogenic microbes on their body surfaces, particularly in environments such as hospitals. Cockroaches are linked with allergic reactions in humans. One of the proteins that trigger allergic reactions is tropomyosin. These allergens are also linked with asthma. About 60% of asthma patients in Chicago are also sensitive to cockroach allergens. Although considered disgusting in Western culture, cockroaches are eaten in many places around the world. Whereas household pest cockroaches may carry bacteria and viruses, cockroaches bred under laboratory conditions can be used to prepare nutritious food. Common household cockroaches can be decontaminated by being isolated and fed a diet of apple and lettuce. In Mexico and Thailand, the heads and legs are removed, and the remainder may be boiled, sauted, grilled, dried or diced. In China, cockroaches have become popular as medicine and cockroach farming is rising. The cockroaches are fried twice in a wok of hot oil, which makes them crispy with soft innards that are like cottage cheese. Fried cockroaches are ground and sold as pills for stomach, heart and liver diseases. Cockroach Facts for Kids. Kiddle Encyclopedia.